Flynn, "The Rebel Girl," was born in Concord, New Hampshire, in a poor working-class family. Her mother was a suffragette. Flynn's exposure to the poverty of textile workers in New Hampshire and later New York City had a profound effect on her. 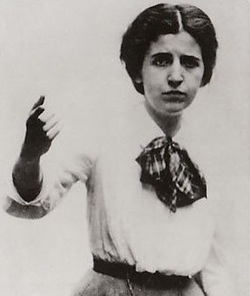 In 1906 she began speaking at Socialist Party street meetings and she joined the IWW in 1907. She soon emerged as an outstanding labor organizer and agitator, displaying stunning leadership abilities in the Lawrence Strike (Massachusetts, 1912) and the Paterson Strike (New Jersey, 1912-13). She had a vibrant, militant style and was widely heralded for her extraordinary energy and courage. Flynn worked closely with Big Bill Haywood and Eugene Debs. She also helped to found the American Civil Liberties Union. In 1937 she joined the CPUSA. In the McCarthy period she was convicted under the Smith Act and received a three-year prison term. In 1961, after the death of Eugene Dennis, she became the chair of the CPUSA. While traveling in the Soviet Union she became ill. She died in Moscow, where a state funeral – attended by Nikita Khrushchev and other Soviet Party leaders was held. She authored two autobiographical volumes. Her ashes were returned to the U.S. for burial at Forest Home. Flynn inspired the IWW's Joe Hill to write a song about her, The Rebel Girl: "Yes, her hands may be hardened from labor, And her dress may not be very fine; But a heart in her bosom is beating That is true to her class and her kind. And the grafters in terror are trembling When her spite and defiance she'll hurl; For the only and thoroughbred lady Is the Rebel Girl.